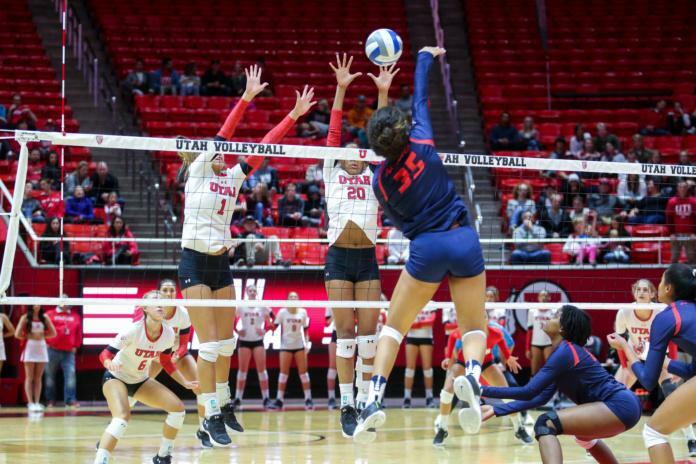 This past weekend, the University of Utah’s women’s volleyball team opened up the 2018 season with their first of three preseason tournaments by hosting and winning the 2018 Utah Volleyball Classic at the Huntsman center. The Utes went 2-1 over the weekend as they faced UC Irvine, Saint Mary’s and Denver. Utah started off strong on Friday, Aug. 24 by sweeping UC Irvine 3-0 with outside hitter, Lauga Gauta, setting the tone for the team with 11 kills in the game. Bailey Choy led the team with 27 assists, Brianna Doehrmann led with ten digs and Phoebe Grace had six blocks during the game. Utah’s first loss of the year happened during the first match Saturday morning, against Saint Mary’s. The first set started off close and the Utes gained a 10-2 run to take the lead, winning the first set 25-14. The Utes started the second set with a 3 point lead but fell through as the Gaels went on a 5-1 run with Utah losing two set points, to lose 27-25. The Gaels started off strong in the third set, but Utah fought back with a 5-0 run to take the lead, winning the third set 25-19. The Gaels came back stronger in the last two sets, winning 31-29 and 15-11. The Utes were successful in accomplishing their goal of taking a win after a loss, as they beat Denver 3-2, making them the overall winners of the 2018 Utah Volleyball Classic. Drews lead the team with 24 kills and finished strong with her second double-double of the day, tallying 15 digs. Lauga Gauta was named the tournament MVP and also finished with a double-double, totaling 17 kills and 15 digs. The Utes will hit the road next week as they compete in the Montana Invitational, and they will play their first match against the host team on Friday, Aug. 31 at 10 a.m.
A loss by a PAC team is not supposed to happen to a team from the WCC. How is that possible?